Veggies can look away now. 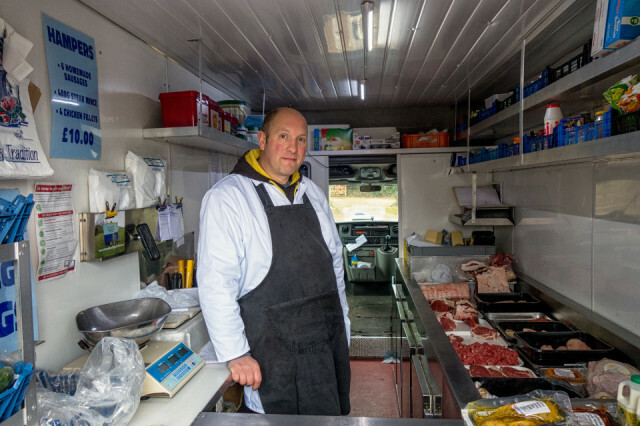 David Mumford and sons (nearly a good name for a band) run a mobile butchers shop amongst other enterprises. I caught them in the village this morning where I am staying to look after little Florence. Curiosity took the better of me and I climbed in the back for a look. Brilliant - a tempting selection of cuts and vacuumed packed oven ready treats. Plus milk and biscuits and lots of other stuff. I didnt realise these mobile services still plied their trade around the countryside. Good on them for providing a valuable service. I had a chat with Carl here and bought some lamb bites - they look good for a lunch after christmas.